Overexpression of the human multidrug-resistance protein (MRP) causes a form of multidrug resistance similar to that conferred by P-glycoprotein, although the two proteins are only distantly related. In contrast to P-glycoprotein, human MRP has also been shown to be a primary active transporter of a structurally diverse range of organic anionic conjugates, some of which may be physiological substrates. At present, the mechanism by which MRP transports these compounds and mediates multidrug resistance is not understood. With the objective of developing an animal model for studies on the normal functions of MRP and its ability to confer multidrug resistance in vivo, we recently cloned the murine ortholog of MRP (mrp). To assess the degree of functional conservation between mrp and MRP, we directly compared the drug cross-resistance profiles they confer when transfected into human embryonic kidney cells, as well as their ability to actively transport leukotriene C4, 17β-Estradiol 17β-(d-glucuronide), and vincristine; mrp and MRP conferred similar drug resistance profiles, with the exception that only MRP conferred resistance to the anthracyclines tested. Consistent with these findings, accumulation of [3H]vincristine and [3H]VP-16 was decreased, and efflux of [3H]vincristine was increased in both murine and human MRP-transfected cell populations, whereas only human MRP-transfected cells displayed decreased accumulation and increased efflux of [3H]daunorubicin. Membrane vesicles derived from both transfected cell populations transported leukotriene C4 in an ATP-dependent manner with comparable efficiency, although the efficiency of 17β-estradiol 17β-(d-glucuronide) transport was somewhat higher with MRP transfectants. ATP-dependent transport of vincristine was also observed with vesicles from mrp and MRP transfectants but only in the presence of glutathione. These studies reveal intrinsic differences between the murine and human MRP orthologs with respect to their ability to confer resistance to a major class of chemotherapeutic drugs. After selection in a single cytotoxic agent, mammalian tumor cells frequently develop simultaneous cross-resistance to structurally unrelated drugs with different subcellular targets. Two human proteins have been identified that, when overexpressed, can confer this form of multidrug-resistance phenotype: Pgp and the more recently identified MRP (1-5). MRP and Pgp are both members of the ATP-binding cassette transporter superfamily, but they share <15% overall amino acid identity (1). Each protein confers resistance to a similar but nonidentical spectrum of natural product anticancer agents that includes anthracyclines, epipodophyllotoxins, and Vincaalkaloids (2, 6-10). However, MRP confers only low levels of resistance to taxol and colchicine and no resistance to mitoxantrone, which are relatively good Pgp substrates (5, 11, 12). In contrast, MRP confers low levels of resistance to certain arsenic- and antimony-centered oxyanions to which Pgp does not confer resistance (7). A considerable body of evidence indicates that Pgp mediates drug resistance by acting as an ATP-dependent efflux pump that decreases intracellular accumulation of cytotoxic drugs (13). MRP has been shown to be a primary active transporter of a diverse array of GSH, glucuronide, and sulfate conjugates, with the cysteinyl leukotriene LTC4 being the highest affinity substrate identified to date (14-18).1However, the mechanism(s) by which the protein transports the cytotoxic drugs to which it confers resistance remains unresolved (9, 16, 18,19). It has not been possible to label the protein with photoactivatable drug analogs (7, 20), and several studies using membrane vesicles from MRP transfectants and drugselected cells have failed to demonstrate ATP-dependent transport of unmodified anthracyclines and epipodophyllotoxins (16-18). Uptake of theVinca alkaloid vincristine and, more recently, the carcinogen aflatoxin B1 by inside-out membrane vesicles derived from MRP-transfected HeLa cells has been demonstrated (16).1 However, active transport of these compounds is dependent not only on the presence of ATP but also on physiological concentrations of GSH. These two compounds are currently the only xenobiotics whose MRP-mediated transport has been shown to be GSH dependent. Murine models have proven extremely useful for analysis of the function and regulation of the Pgps (8, 21, 22). In addition, elimination of expression of the murine Pgp isoforms in the intact mouse has provided insight into the physiological roles of these proteins and the possible consequences of inhibiting or inactivating them in a clinical setting (23, 24). As a first step toward establishing such models for studying MRP, we cloned and characterized a murine mRNA encoding a polypeptide predicted to be 88% identical with the human protein (25). Comparison with the degree of conservation between other murine and human ABC-transporter orthologs, such as those of CFTR and the Pgps, indicates that the protein is extremely likely to be the mouse ortholog of MRP (mrp) (25). Only a few drug-selected, murine cell lines have been described that overexpress mrp mRNA, and none have been characterized with respect to expression of the protein itself (26, 27). It is not known to what extent the pharmacological characteristics of the human and murine proteins are conserved. Several vincristine-selected multidrug-resistant sublines of the murine erythroleukemia cell line PC4 have been shown to overexpress mrp mRNA. These cells are cross-resistant to VP-16, but they show very little resistance to doxorubicin, a drug that has been used to derive the majority of human cell lines that overexpress MRP. One other murine leukemia cell line has been described, WEHI-3B/NOVO, that also overexpresses mrp mRNA (27). This cell line was selected in novobiocin and, like the PC4 derivatives, was also found to be cross-resistant to VP-16 but not to vincristine (26, 27). Comparison of the phenotypes of drug-selected cell lines is confounded by the influence of cell background on drug resistance profiles and the probability of multiple events having occurred during the selection process. To obtain a more direct indication of the drug-resistance phenotypes conferred by MRP and mrp, we constructed stable transfectants of HEK cells that express either the human or murine protein. The pharmacological phenotypes of populations of transfected cells were then characterized with respect to their resistance to a panel of chemotherapeutic agents, as well as several arsenical and antimonial oxyanions. We also determined the kinetics of drug accumulation and efflux by populations of transfected cells and the ability of membrane vesicles prepared from them to directly transport vincristine. Finally, we compared the efficiency with which mrp and MRP transport two potential physiological substrates, LTC4 and E217βG (15, 16,18). Doxorubicin HCl, daunorubicin HCl, vincristine sulfate, colchicine, VP-16, vinblastine, and novobiocin (sodium salt) were purchased from Sigma Chemical (St. Louis, MO). Epirubicin HCl was obtained from Pharmacia (Mississauga, Ontario, Canada). Sodium arsenite and potassium antimony tartrate were from J. T. Baker Chemical (Phillipsburg, NJ). [3H]Vincristine (specific activity, 6.7 Ci/mmol) was purchased from Amersham (Oakville, Ontario, Canada). [3H]Daunorubicin (specific activity, 5 Ci/mmol), [3H]LTC4(specific activity, 132 Ci/mmol), and [3H]E217βG (specific activity, 49Ci/mmol) were from Dupont Canada (Markham, Ontario, Canada). [3H]VP-16 (specific activity, 972 mCi/mmol) was from Moravek Biochemicals (Brea, CA). The construction of full-length cDNAs encoding MRP and mrp, their incorporation into the expression vector pCEBV7, and the establishment of the MRP-transfected HeLa cell population, T14, have been previously described (2, 7, 25,28). HEK 293 cells were transfected with parental vector or vector containing either MRP or mrp coding sequences using LipofectAMINE (GIBCO BRL, Burlington, Ontario, Canada) according to the manufacturer’s instructions. Briefly, cells were seeded at an initial density of 2 × 105 cells/well in a six-well tissue culture dish and transfected ∼24 hr later by overlaying the washed cells with 1 ml of serum-free medium containing 2 μg of supercoiled DNA previously mixed with 6 μl LipofectAMINE. After 5 hr, 1 ml of medium containing 10% fetal calf serum was added to the cells. The medium was replaced 24 hr after transfection, and cells were cultured for an additional 48 hr before being subcultured into six wells containing fresh medium supplemented with 100 μg/ml hygromycin B (Sigma). After ∼3 weeks in drug-supplemented medium, the levels of mrp or MRP expression were determined in the surviving cell populations, as described below. Determination of human and murine MRP levels in transfected cells. The levels of expression of MRP and mrp in transfected cell populations were determined by immunoblot analyses of membrane protein fractions as previously described (2, 29). After the transfer of proteins to Immobilon-P polyvinylidene difluoride membranes (Millipore, Bedford, MA), both mrp and MRP were detected using an affinity-purified rabbit antiserum, MRP-1. MRP-1 was raised against a synthetic peptide corresponding to amino acids 765–779 of MRP, which is identical in mrp (25, 29, 30). Antibody binding was detected with horseradish peroxidase-conjugated goat anti-rabbit IgG (Jackson ImmunoResearch, West Grove, PA) and enhanced chemiluminescence detection (DuPont-New England Nuclear, Boston, MA). Deglycosylation of MRP in transfected cells. The extent of N-linked glycosylation of MRP in transfected HeLa and HEK 293 cells was assessed by treatment of membranes with PNGase F. Membrane protein (20 μg) was incubated overnight at 37° in the presence or absence of 1000 units of PNGase F (New England Biolabs, Mississauga, Ontario, Canada). Samples were then analyzed by immunoblotting as described above. The tetrazolium salt-based microtiter plate 3-(4,5-dimethylthiazol-2-yl)-2,5-diphenyltetrazolium bromide assay was used to determine resistance of the transfected cell populations to various chemotherapeutic agents and some heavy metal oxyanions (7, 31). Briefly, cells were seeded in 96-well plates at a density of 1 × 104 cells/well in medium supplemented with 10% fetal calf serum. They were exposed to drug 24 hr later and then incubated for an additional 72 hr before being harvested. Relative resistance is expressed as the ratio of the IC50 value of cells transfected with human or murine MRP expression vectors compared with cells transfected with parental vector. Resistance was determined in two or more independent experiments, and within each experiment, assays were carried out in quadruplicate. A vehicle control was included for VP-16 because the drug was dissolved in 10% dimethylsulfoxide and 45% ethanol. At the highest concentration of vehicle used, cell viability was reduced by no more than 10%. All other drugs were dissolved and diluted in phosphate-buffered saline or medium. Drug accumulation and efflux in transfected cell populations. Accumulation and efflux of [3H]-labeled drug were measured essentially as previously described (32). Briefly, to measure accumulation of [3H]vincristine, [3H]daunorubicin and [3H]VP-16 cells (1.1 × 106 cells/ml) were incubated at 37° with drug (1 μm) in Dulbecco’s modified Eagle’s medium supplemented with 5 mm4-(2-hydroxyethyl)-1-piperazineethanesulfonic acid, pH 7.0, 10 mm glucose, and 5% fetal bovine serum. Aliquots of suspended cells were removed at selected times, and accumulation of drug was stopped by the addition of ice-cold phosphate-buffered saline. Because of practical limitations, the earliest time point taken was 7–10 sec after mixing of drug and cells. Cells were centrifuged and washed in 1 ml ice-cold phosphate-buffered saline; after recentrifugation, cell pellets were solubilized in 1% sodium dodecyl sulfate. Cell-associated radioactivity was determined by liquid scintillation counting, and results were expressed as picomoles of drug/106 cells. Efflux of [3H]vincristine or [3H]daunorubicin from transfected cells was measured after preincubation in drug for 1 hr at 37°, as described above. Cells were then centrifuged, washed twice with ice-cold phosphate-buffered saline, resuspended in drug-free medium, and incubated at 37°. Aliquots of suspended cells were removed at various times and processed as described above. Cell-associated radioactivity was determined, and results were expressed as the percent of radioactivity remaining relative to that present immediately after washing. Vesicle transport of LTC4, E217βG, and vincristine. The rate of ATP-dependent transport of [3H]LTC4 or [3H]E217βG into plasma membrane vesicles from transfected cell populations was determined as previously described (15, 16). Briefly, vesicles (2 μg of protein) were incubated at 23° (LTC4) or 37° (E217βG) in transport buffer [50 mm Tris·HCl, 250 mm sucrose, 0.02% (w/v) sodium azide, pH 7.4] containing 4 mm AMP or ATP and 10 mm MgCl2, and various concentrations of [3H]LTC4 or [3H]E217βG (final volume, 25 μl). Uptake was terminated by rapid dilution of the reaction mixture in 1 ml of ice-cold transport buffer, followed by filtration through glass-fiber filters (Type A/E; Gelman Sciences, Dorval, Quebec, Canada) using a Hoeffer filtration manifold (Hoeffer Scientific Instruments, San Francisco, CA) under vacuum. Filters were immediately washed twice with 5 ml of cold transport buffer and dried, and vesicle-associated radioactivity was determined. All data were corrected for the amount of [3H]LTC4 or [3H] E217βG that remained bound to the filter in the absence of vesicle protein, which was <5% of the total radioactivity. Preliminary experiments were carried out to define the time period for which LTC4 and E217βG uptake was linear with each of the membrane preparations. Uptake of [3H]vincristine (200 nm; 70 nCi) was measured as described above except that 20 μg of vesicle protein were used for each time point; in certain cases, GSH (5 mm ) was added to the transport buffer. Steady state levels of vesicle-associated [3H]vincristine were determined at 37° after 10 min. Uptake was stopped by rapid dilution in transport buffer as above and filtration through glass-fiber filters, which had been presoaked overnight at 37° in 10% (w/v) bovine serum albumin. Expression of murine and human MRP in HEK 293 cells. Episomal vectors containing expression cassettes for either mrp or MRP, as well as the parental pCEBV7 vector, were transfected into HEK 293 cells, and populations of transfected cells were selected in hygromycin. Levels of mrp and MRP protein in the transfectants were then determined by immunoblot analysis of membrane-enriched fractions with the polyclonal antiserum MRP-1 (25, 30). An immunoreactive protein of identical size was readily detectable in membranes from cell populations transfected with mrp (HEKmrp) or MRP (HEKMRP). Under the conditions used for immunoblotting, no endogenous MRP was detected in cells transfected with parental vector (HEKPC7) (data not shown.). 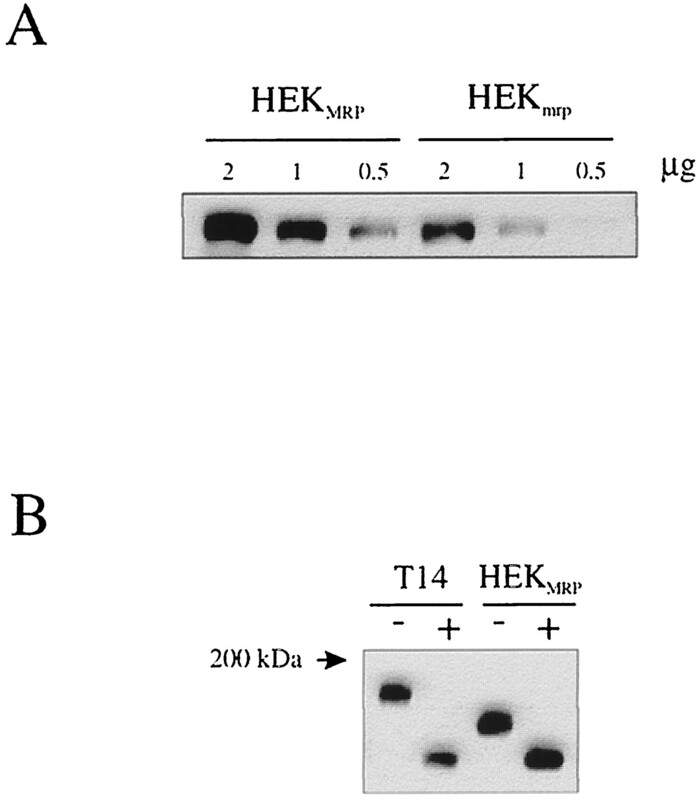 Comparison with MRP produced in previously characterized HeLa cells indicated that the proteins in the HEK transfectants were slightly smaller (2, 7). However, this size difference was eliminated by treatment of membranes from the HeLa and HEK transfectants with PNGase F, demonstrating that it was attributable to differences in the extent of N-linked glycosylation of MRP in the two cell populations (Fig.1B). Immunoblotting also indicated that the levels of MRP in the HEKMRP cell population were ∼2–3-fold higher than the levels of mrp in HEKmrp cells and ∼2-fold higher than the MRP-transfected HeLa cell population. A, Levels of human MRP and murine mrp protein in transfected HEK 293 cells. Membrane proteins (0.5, 1, and 2 μg) prepared from HEKmrp and HEKMRP cell populations were separated by sodium dodecyl sulfate-polyacrylamide gel electrophoresis and transferred to polyvinylidene difluoride membrane, as described in Materials and Methods. Blots were probed with affinity-purified polyclonal antiserum MRP-1, which is capable of detecting both mrp and MRP proteins. No endogenous MRP was detected in control HEKPC7 cells (data not shown). B, PNGase F treatment of membranes from MRP-transfected HEK 293 and HeLa cells. Membrane proteins (20 μg) prepared from HEKMRP and MRP-transfected HeLa cells (T14) were incubated overnight in the presence (+) or absence (−) of PNGase F, and 5 μg of each was subjected to electrophoresis and immunoblotting (as in A). Drug resistance profiles of transfected HEK 293 cells. Transfected cell populations were tested for their resistance to a number of compounds using the 3-(4,5-dimethylthiazol-2-yl)-2,5-diphenyltetrazolium bromide assay (Tables 1 and2). Typical dose-response curves for HEKMRP and HEKmrp cells exposed to vincristine or VP-16 are shown in Fig.2. Expression of either the human or murine protein increased the relative resistance to vincristine, vinblastine, and VP-16, approximately in proportion to their relative levels of expression (Table 1 and Fig. 2). Both mrp and MRP conferred substantially higher levels of resistance to vincristine than vinblastine, and neither protein increased resistance to cisplatin (7). One of the characteristics of MRP observed previously with HeLa transfectants was the ability to confer low-level resistance to certain heavy metal oxyanions (7). Both HEKmrp and HEKMRP populations were also found to be 2–3-fold resistant to potassium antimony tartrate and sodium arsenite (Table 2). However, significant differences were observed between the resistance profiles of human and murine MRP transfectants when testing several anthracyclines (Table 1). Typical dose-response curves obtained for doxorubicin, epirubicin, and daunorubicin are shown in Fig.3. As expected, the HEKMRP cell population displayed moderate-to-high levels of resistance (5–9-fold) to all three anthracyclines (2, 7, 9). In contrast, the HEKmrp cells showed no detectable increase in resistance to any of these drugs compared with control transfectants. Resistance of transfected HEK 293 cells to vincristine and VP-16. Cells transfected with vectors expressing mrp (HEKmrp, •) or MRP (HEKMRP, ▪) and cells transfected with vector alone (HEKPC7, ○) were tested for resistance to vincristine and VP-16, as described in Materials and Methods. The results shown are those of a typical experiment. Values are mean ± standard deviation of quadruplicate determinations. In all cases, the standard deviation was <10%. Resistance of transfected HEK 293 cells to anthracyclines. HEKmrp (•), HEKMRP (▪), and HEKPC7 (○) cell populations were tested for resistance to doxorubicin, daunorubicin, and epirubicin as de- scribed in the legend to Fig. 2. Results are of a typical experiment. Values are mean ± standard deviation of quadruplicate determinations. In all cases, the standard deviation was <10%. Because the mrp overexpressing multidrug-resistant murine leukemia cell line WEHI-3B/NOVO was selected in novobiocin (27), we determined whether the HEKmrp and HEKMRP populations were also resistant to this antibiotic. The increase in novobiocin resistance with either the murine or human protein was <2-fold and only statistically significant in the HEKMRP population (p > 0.05 for HEKmrpcells, p < 0.001 for HEKMRPcells) (Table 1). To further investigate the lack of anthracycline resistance in HEKmrptransfectants, we carried out a series of drug accumulation and efflux studies. The consequences of overexpression of MRP on drug accumulation and efflux have been found to be somewhat more variable than that observed with cells that overexpress Pgp (3, 4). This has prompted the suggestion that in some cell types the protein may act to both efflux drug from the cell and sequester drug within intracellular vesicles. In MRP-transfected HeLa and HEK cells, we previously observed a 30–50% decrease in accumulation of daunorubicin, which was accompanied by modest increases in drug efflux. Consequently, we initially assessed whether the mrp-transfected cells behaved in a similar fashion by measuring the time course of [3H]daunorubicin accumulation and efflux in both populations of transfectants. Steady state levels of drug accumulation were reached by 60 min in both control and mrp/MRP-transfected cell populations (Fig.4A), with accumulation of [3H]daunorubicin in the HEKMRP cell population being ∼30% lower than that in HEKPC7 control cells (7). In contrast, no difference was found between the rates or steady state levels of accumulation of [3H]daunorubicin in populations of control and mrp-transfected cells. The HEKMRPpopulation also effluxed [3H]-labeled drug faster than control transfectants (72% versus 94% of drug remaining in the HEKMRP and HEKPC7cells, respectively, after 5 min), whereas HEKmrpand HEKPC7 cells effluxed drug at similar rates (Fig. 4B). Even after 60 min in drug-free medium, no significant difference could be detected between the proportion of drug remaining in the mrp transfected and control populations (72% versus 68% for HEKPC7 and HEKmrp cells, respectively). Accumulation and efflux of [3H]daunorubicin was measured in HEKmrp(•), HEKMRP (▪), and HEKPC7 (○) cell populations. A, To measure drug accumulation, cells were incubated in the presence of [3H]daunorubicin at 37°, and cell-associated radioactivity was determined at the times indicated. Results are of a typical experiment. Values are mean ± standard deviation of triplicate determinations in a single experiment; each experiment was repeated at least two additional times. B, To measure drug efflux, cells were preincubated in the presence of [3H]daunorubicin for 60 min at 37°, washed, and then resuspended in drug-free medium. Cell-associated radioactivity was determined at the times indicated and expressed as a percentage of the radioactivity present immediately after the cells were washed. Values are mean ± standard deviation of triplicate determinations in a single experiment; each experiment was repeated at least one additional time. We also examined accumulation of two drugs to which both MRP and mrp conferred resistance, vincristine and VP-16. Steady state levels of [3H]vincristine were established within ∼60 min in all three cell populations. Accumulation was reduced relative to HEKPC7 cells by ∼20% and ∼40% in the HEKmrp and HEKMRPpopulations, respectively (Fig. 5B). The steady state levels of [3H]VP-16 were also reduced in both HEKmrp and HEKMRP populations compared with control cells, by ∼30% and ∼61%, respectively (Fig. 5A). The initial rate of VP-16 accumulation is extremely rapid and results in significant levels of drug accumulation at the earliest time point taken (10 sec) for both transfectants and control cells. However, differences in the rate of [3H]VP-16 accumulation by the mrp/MRP transfectants were apparent within 5 min of the addition of drug, and steady state levels were established by 15 min. Finally, we measured the rate of [3H]vincristine efflux from both transfected cell populations; both effluxed drug more rapidly than the control population. After incubation for 60 min in drug-free medium, 65% of the vincristine remained associated with HEKPC7 control cells, whereas only 54% and 34% remained associated with the HEKmrp and HEKMRP cells, respectively (Fig. 5C). Accumulation and efflux of [3H]vincristine and accumulation of [3H]VP-16 in HEKmrp (•), HEKMRP(▪), and HEKPC7 (○) cell populations were determined as described in Fig. 4. Accumulation experiments were repeated at least two additional times, and efflux of vincristine was measured in one additional experiment. A, Accumulation of [3H]VP-16. B, Accumulation of [3H]vincristine. C, Efflux of [3H]vincristine. GSH- and ATP-dependent uptake of [3H]vincristine. To confirm the ability of the murine protein to actively transport vincristine, we examined the ATP-dependent uptake of [3H]vincristine by membrane vesicles from the HEKmrp, HEKMRP, and HEKPC7 cell populations (Fig. 6). No significant ATP-dependent uptake of [3H]vincristine was observed with any of the membrane preparations, nor was there any significant difference between the levels of ATP-independent uptake (8–9 pmol/mg of protein) by vesicles from MRP/mrp transfectants and control cells. However, the addition of GSH (5 mm) increased ATP-dependent uptake to 25–26 pmol/mg of protein with vesicle preparations from both HEKmrp and HEKMRP while having no effect on uptake by control vesicles. 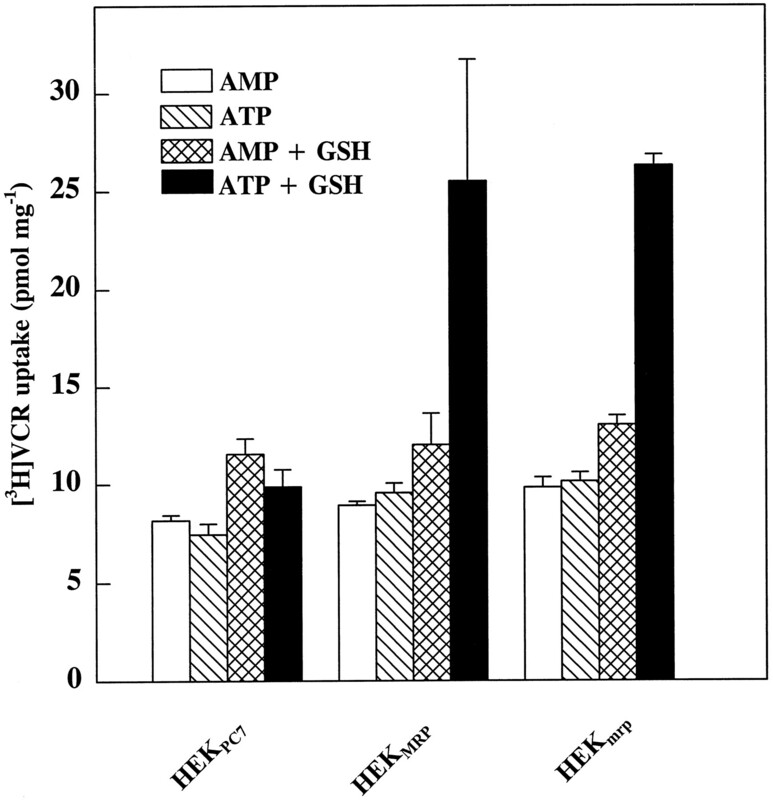 GSH also had no significant effect on ATP-independent uptake by any of the vesicle preparations. [3H]Vincristine uptake by membrane vesicles from populations of HEKPC7, HEKmrp, and HEKMRP cells were incubated with 200 nm[3H]vincristine in transport buffer (final volume, 50 μl) at 37° for 10 min in the presence or absence of 4 mm ATP or 5′-AMP and 5 mm GSH, as indicated. Values are mean ± standard deviation of triplicate determinations in a single experiment. LTC4 and E217βG uptake in membrane vesicles. To determine whether there were detectable differences in the ability of the murine and human proteins to transport potential physiological substrates, we also examined some kinetic parameters of ATP-dependent transport of LTC4 and E217βG by HEKmrp and HEKMRP membrane vesicles. 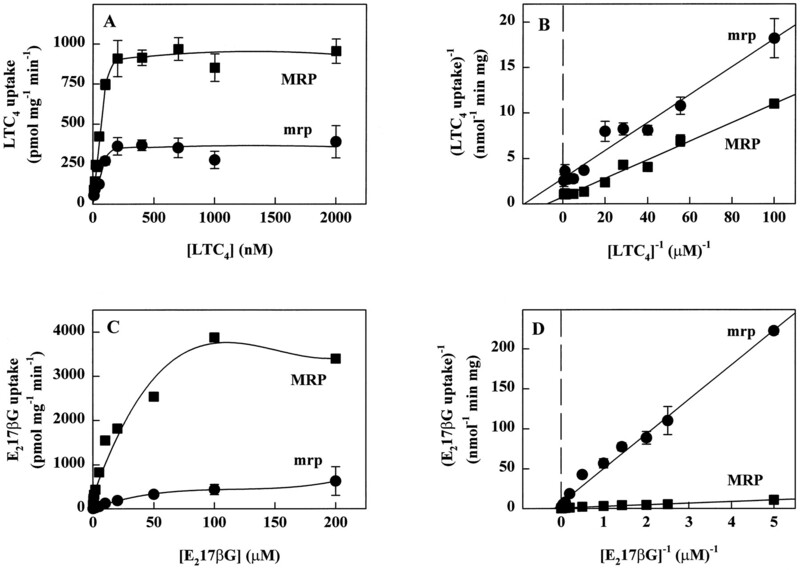 The initial rates of ATP-dependent [3H]LTC4accumulation by vesicles from murine and human transfectants were determined as a function of [3H]LTC4 concentration (Fig. 7, A and B). Vesicles from the HEKPC7 control population displayed no significant ATP-dependent [3H]LTC4 accumulation (data not shown). A Lineweaver-Burk transformation of the data (Fig. 7B) yielded similar Km values for the human and murine proteins of 98 and 60 nm, respectively, and theV max values for HEKMRP vesicles (920 pmol/mg/min) and HEKmrp vesicles (350 pmol/mg/min) correlated well with the relative levels of MRP or mrp present in the respective membrane preparations. Effect of substrate concentration on ATP-dependent [3H]LTC4 and [3H]E217βG uptake by membrane vesicles from transfected cell populations. Initial rates of ATP-dependent [3H]LTC4 (A and B) and [3H]E217βG (C and D) uptake by HEKmrp (•) and HEKMRP (▪) membrane vesicles were determined at various substrate concentrations (0.01–2 μm for LTC4; 0.2–200 μm for E217βG) as indicated. All data were corrected for ATP-independent uptake by subtraction of vesicle-associated radioactivity in the presence of 4 mm 5′-AMP from values obtained at comparable time points in the presence of 4 mmATP and are plotted as Vo versus [S] (A and C) to confirm that the appropriate concentration range was selected to permit observation of both zero-order and first-order rate kinetics. Kinetic parameters for LTC4 (B) and E217βG (D) transport were subsequently determined from regression analysis of the Lineweaver-Burk transformation of the data. Results are mean ± range of duplicate determinations at each substrate concentration in a single experiment, and comparable values were obtained in one additional experiment for each substrate. A comparable series of experiments was carried out using E217βG as substrate (Fig. 7, C and D). Again, the Km values for the human and murine proteins were similar (4.8 and 2.9 μm for mrp and MRP, respectively). However, with this substrate, theV max value obtained with vesicles containing mrp (0.11 nmol/mg/min) was ∼10-fold less than the value obtained with HEKMRP vesicles (1.4 nmol/mg/min). Little is known of the extent of functional conservation between MRP and its mammalian orthologs. To provide a basis for physiological studies of this transporter and its influence on drug dispositionin vivo, we directly compared the drug resistance profiles conferred by mrp and MRP, as well as their ability to transport two potential physiological substrates. Each protein was produced in HEK 293 cells, which express very low levels of endogenous MRP; to avoid position effects, which can influence the level of expression from integrating vectors, we used a vector that replicates episomally in primate cells. The populations of transfectants obtained expressed MRP and mrp at levels that differed at most by 2–3-fold. Because of the possibility of introducing ancillary changes that could influence drug cross-resistance profiles, no attempt was made to further normalize the levels of mrp/MRP expression by cloning and secondary selection of cells in a chemotherapeutic agent. Comparison of the drug resistance profiles of populations of mrp and MRP transfectants revealed a good correlation between the relative increase in resistance to vincristine, vinblastine, and VP-16 and the levels of expression of the mouse and human proteins. 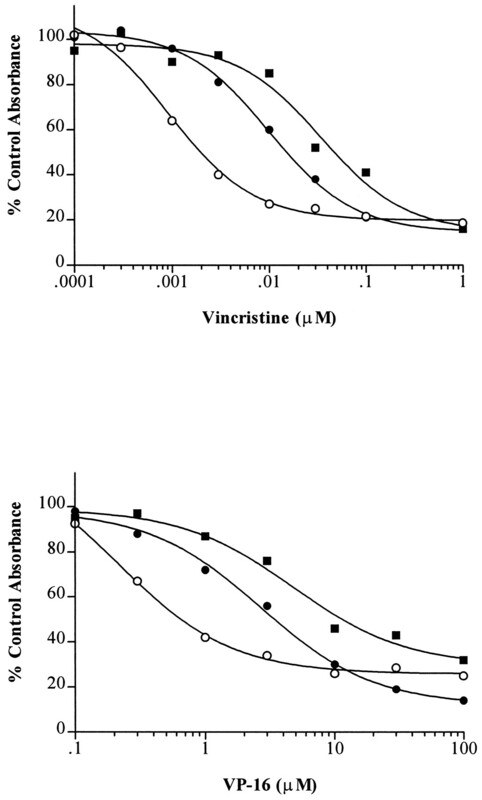 Notably, cells transfected with MRP display significantly higher levels of resistance to vincristine than vinblastine; a similar profile of resistance to these twoVinca alkaloids was also observed with the mrp transfectants. It has been suggested that MRP may be involved in cisplatin resistance in some drug-selected cell lines (33). However, neither mrp nor MRP increased the resistance of transfected HEK 293 cells to this drug, as found previously with other cell types transfected with MRP (2, 9, 7, 10). Finally, mrp was at least as effective as its human homolog at conferring resistance to arsenical and antimonial oxyanions (7). Thus, with respect to these drugs and heavy metal oxyanions, the drug resistance profiles of mrp and MRP seem to be very similar. Only one direct comparison of the drug resistance profiles of cells transfected with murine and human Pgps has been reported (8). In this study, the murine isoforms mdr1 and mdr3 and human MDR1 were stably transfected into Chinese hamster ovary cells, and vinblastine-selected clones expressing similar levels of Pgps were compared. These studies revealed marked differences between the resistance profiles of the three proteins with respect to individual drugs. Both murine isoforms conferred similar levels of resistance to doxorubicin and vinblastine but differed with respect to their ability to increase resistance to actinomycin D. The human protein conferred similar levels of vinblastine resistance and possibly somewhat lower levels of doxorubicin resistance but was far less effective than the mouse proteins at conferring resistance to colchicine. Despite these differences, the mouse and human Pgps confer resistance to three major classes of natural product drugs commonly used as therapeutic agents: the Vinca alkaloids, epipodophyllotoxins, and anthracyclines (8, 11, 22, 34). The most striking difference that we observed between the drug resistance profiles of mrp and MRP was that the mouse protein failed to confer resistance to anthracyclines. Because structural variation among the anthracyclines might be expected to result in drug-specific differences in the relative levels of resistance conferred, we tested three compounds belonging to this drug class. Resistance to all three was readily detectable with the HEKMRP population, which was ∼10-fold resistant to both doxorubicin and epirubicin and 5–6-fold resistant to daunorubicin. However, no resistance to any of these anthracyclines could be detected in the mrp-transfected cells, suggesting that the lack of resistance conferred by the murine protein may be generally applicable to this class of chemotherapeutic agents. It is extremely unlikely that this difference in sensitivity can be explained simply by the 2–3-fold lower level of the murine protein. Resistance to vinblastine and VP-16, to which the HEKMRP population was 5- and 14-fold resistant, respectively, was readily apparent in the HEKmrppopulation, but we detected no suggestion of increased resistance to the anthracyclines. Furthermore, the results of chemosensitivity assays were corroborated by drug accumulation and efflux experiments. Both mrp and MRP decreased accumulation of vincristine and VP-16 in transfected cells, but unlike MRP, the murine protein had no effect on accumulation or efflux of daunorubicin. The previously described mrp-overexpressing derivatives of erythroleukemic PC4 cells showed little or no resistance to doxorubicin (26); however, they were selected in vincristine and displayed higher levels of resistance to this drug than any others tested, raising the possibility that the choice of selecting drug may have influenced the phenotype obtained (26). The mrp cDNAs used to construct the expression vector described here were cloned from normal skeletal muscle, and the transfectants were selected only in hygromycin, substantially reducing the possibility of selecting for mutated forms of mrp. Thus, the similarity between the drug resistance profiles of HEKmrp transfectants and the vincristine-selected PC4 cells strongly supports the suggestion that the relative lack of anthracycline resistance is an intrinsic property of mrp (26). With respect to the transfectants, the possibility that species-specific interactions with other membrane proteins may be required for mrp to confer anthracycline resistance has not been formally excluded. The generation of comparable populations of mrp-transfected murine cells is not possible because the episomal expression vectors currently available are not capable of replicating in murine cells. However, MRP expressed in murine NIH 3T3 cells retains its ability to confer anthracycline resistance (10). This observation, combined with the similarity between the drug resistance profiles of the HEKmrp population and the vincristine-selected PC4 sublines, argues strongly against the possibility that a requirement for species-specific interactions explains the lack of resistance of the mrp transfectants to this class of drugs (10). The drug resistance profiles of the HEKmrptransfectants are quantitatively similar to the multidrug-resistant variant of PC4, PC-V10. These cells are ∼11-, ∼5-, and ∼4-fold resistant to vincristine, vinblastine, and VP-16, respectively, but not significantly resistant to doxorubicin (26). This drug resistance profile differs considerably from that reported for the novobiocin-selected murine monomyelocytic leukemia cell line WEHI-3B/NOVO (27). The mrp/MRP transfectants do display a low level of resistance to novobiocin; however, the WEHI-3B/NOVO cells are not cross-resistant to vincristine. The results described here demonstrate that mrp confers resistance to vincristine, that it decreases accumulation of this drug in intact cells, and that it mediates ATP- and GSH-dependent vincristine uptake in membrane vesicle preparations. Consequently, it will be of interest to determine whether the WEHI-3B/NOVO cells express an altered form of the protein or whether other factors are influencing the drug resistance profile of these cells. A number of potential physiological substrates for MRP have been identified (3, 15-18). The different drug resistance profiles of the mrp and MRP transfectants we observed raised the possibility that the murine and human proteins might also differ with respect to their ability to transport some of these compounds. Consequently, we examined the kinetic parameters with which the two proteins transported the two best characterized candidate substrates, the cysteinyl leukotriene LTC4 and the cholestatic estrogen conjugate E217βG. Studies with the murine mastocytoma cell line L138C3–10a provided the first evidence that the transporter responsible for LTC4 efflux from these cells was the murine ortholog of MRP (14). TheKm value of 60 nm that we determined for mrp transfectants agrees well with the value obtained with mastocytoma cells (70 nm). As might be expected, given the relatively high level of expression of mrp in the HEKmrpcells, the V max value of 351 pmol/mg/min at 23° obtained with vesicles from the transfectants was ∼30-fold higher than the value obtained at 37° with vesicles from mastocytoma cells (13 pmol/min/mg). The similarKm values for LTC4 determined for MRP and mrp, together with the fact that the V max values are proportional to the differences in levels of expression of the two proteins, indicate that the proteins transport LTC4 with comparable efficiency. This may not be the case with respect to transport of E217βG. Although Km values for E217βG obtained with the murine and human proteins were similar, the V max value obtained with vesicles from the mrp-transfected population was ∼10-fold lower than that of the HEKMRPvesicles. Whether the difference observed is specific for this particular glucuronide or applies to other glucuronide conjugates transported by MRP remains to be determined. It is not known which regions of mrp and MRP are responsible for the differences in the drug resistance profiles conferred by each protein. Previous studies with the Pgps have demonstrated that profound changes in substrate specificity can result from single amino acid alterations in various regions, including 6 of the 12 TM helices of the protein (TM3, TM4, TM6, and TM10–12) (35-37). Photoaffinity labeling studies also indicate that residues in some of these TM regions, such as TM11, interact directly with certain drug substrates and reversing agents (36). To date, the only substrate that MRP has been shown to bind is LTC4, and regions of the protein involved have not been identified. However, based on our previously published hydropathy alignment, the predicted TMs of mrp and MRP that may be topologically equivalent to the TMs of the Pgps implicated in drug specificity differ by only nine amino acids (25, 35-37). Three of these, corresponding to TM3, TM6, and TM11, are identical (35, 36). This high degree of structural conservation should facilitate studies to determine whether these regions play as important a role in determining the substrate specificity and drug resistance profiles of mrp and MRP as they do in the Pgps. We thank K. Sparks and M. Vasa for able technical assistance, G. M. Wilson for advice on transfection protocols, and K. C. Almquist (Queen’s University, Kingston, Canada) for purification of the MRP-1 antiserum. ↵1 D. W. Loe, R. K. Stewart, T. E. Massey, R. G. Deeley, and S. P. C. Cole. ATP-dependent transport of aflatoxin B1 and its glutathione conjugates by the product of the multidrug resistance protein (MRP) gene. Submitted for publication. This work was supported by Grant 4570 from the National Cancer Institute of Canada with funds from the Canadian Cancer Society, Grant MT-10519 from the Medical Research Council of Canada, and the Ontario Cancer Treatment and Research Foundation. B.D.S. is supported by an Ontario Graduate Scholarship and in part by a Queen’s University Graduate Award. D.R.H. is supported by a studentship from the Medical Research Council of Canada. S.P.C.C. is a Senior Scientist of the Ontario Cancer Foundation. R.G.D. is the Stauffer Research Professor of Queen’s University. (1992) Overexpression of a transporter gene in a multidrug-resistant human lung cancer cell line. Science (Washington D. C.) 258:1650–1654. (1994) Overexpression of multidrug resistance-associated protein (MRP) increases resistance to natural product drugs. Cancer Res. 54:357–361. (1996) Biology of the multidrug resistance-associated protein, MRP. Eur. J. Cancer 32A:945–957. (1989) The biochemistry of P-glycoprotein-mediated multidrug resistance. Annu. Rev. Biochem. 58:137–171. (1996) Multidrug resistance mediated by the multidrug resistance protein (MRP) gene. Biochem. Pharmacol. 52:967–977. (1994) Pharmacological characterization of multidrug resistant MRP-transfected human tumor cells. Cancer Res. 54:5902–5910. (1995) Human (MDR1) and mouse (mdr1, mdr3) P-glycoproteins can be distinguished by their respective drug resistance profiles and sensitivity to modulators. Biochemistry 34:32–39. (1994) The human multidrug resistance-associated protein MRP is a plasma membrane drug-efflux pump. Proc. Natl. Acad. Sci. USA 91:8822–8826. (1995) Expression of multidrug resistance-associated protein in NIH/3T3 cells confers multidrug resistance associated with increased drug efflux and altered intracellular drug distribution. Cancer Res. 55:5342–5347. (1990) Multidrug resistance phenotype of human BRO melanoma cells transfected with a wild-type human mdr1 complementary DNA. Cancer Res. 50:1779–1785. (1992) Biochemical and genetic characterization of the multidrug resistance phenotype in murine macrophage-like J774.2 cells. Biochem. Pharmacol. 43:77–87. (1995) Using purified P-glycoprotein to understand multidrug resistance. J. Bioenerg. Biomem. 27:7–13. (1994) Characterization of the ATP-dependent leukotriene C4 export carrier in mastocytoma cells. Eur. J. Biochem. 220:599–606. (1996) ATP-dependent 17β-estradiol 17-(β-d-glucuronide) transport by multidrug resistance protein: inhibition by cholestatic steroids. J. Biol. Chem. 271:9683–9689. (1996) Multidrug resistance protein (MRP)-mediated transport of leukotriene C4 and chemotherapeutic agents in membrane vesicles: demonstration of glutathione-dependent vincristine transport. J. Biol. Chem. 271:9675–9682. (1994) Overexpression of the gene encoding the multidrug resistance-associated protein results in increased ATP-dependent glutathione S-conjugate transport. Proc. Natl. Acad. Sci. USA 91:13033–13037. (1996) Transport of glutathione, glucuronate, and sulfate conjugates by the MRP gene-encoded conjugate export pump. Cancer Res. 56:988–994. (1996) Cellular and in vitro transport of glutathione conjugates by MRP. Biochemistry 35:5719–5725. (1989) Mechanisms of multidrug resistance in HL60 cells: analysis of resistance associated membrane proteins and levels of mdr gene expression. Biochem. Pharmacol. 38:3611–3619. (1991) Functional analysis of chimeric genes obtained by exchanging homologous domains of the mouse mdr1 and mdr2 genes. Mol. Cell. Biol. 11:595–603. (1990) Two members of the mouse mdr gene family confer multidrug resistance with overlapping but distinct drug specificities. Mol. Cell. Biol. 10:1652–1663. (1994) Disruption of the mouse mdr1a P-glycoprotein gene leads to a deficiency in the blood-brain barrier and to increased sensitivity to drugs. Cell 77:491–502. (1994) The human MDR3 P-glycoprotein promotes translocation of phosphatidylcholine through the plasma membrane of fibroblasts from transgenic mice. FEBS Lett. 354:263–266. (1996) Structure and expression of the messenger RNA encoding the murine multidrug resistance protein, an ATP-binding cassette transporter. Mol. Pharmacol. 49:962–971. (1994) Overexpression of the multidrug resistance-associated protein (MRP) gene in vincristine but not doxorubicin-selected multidrug-resistant murine erythroleukemia cells. Cancer Res. 54:5607–5613. (1995) Increased rate of adenosine triphosphate-dependent etoposide (VP-16) efflux in a murine leukemia cell line overexpressing the multidrug resistance-associated protein (MRP) gene. Cancer Res. 55:4352–4360. (1995) An episomal expression vector system for monitoring sequence-specific effects on mRNA stability in human cell lines. Plasmid 33:198–207. (1995) Characterization of the 190 kDa multidrug resistance protein (MRP) in drug-selected and transfected human tumor cells. Cancer Res. 55:102–110. (1996) Location of a protease hypersensitive region in the multidrug resistance protein (MRP) by mapping of the epitope of MRP-specific monoclonal antibody QCRL-1. Cancer Res. 56:3307–3314. (1990) Patterns of cross-resistance in a multidrug-resistant small-cell lung carcinoma cell lines. Cancer Chemother. Pharmacol. 26:250–256. (1991) Non-P-glycoprotein-mediated multidrug resistance in a small cell lung cancer cell line: evidence for decreased susceptibility to drug-induced DNA damage and reduced levels of topoisomerase II. Cancer Res. 51:3345–3352. (1996) Coordinated induction of MRP/GS-X pump and gamma-glutamylcysteine synthetase by heavy metals in human leukemia cells. J. Biol. Chem. 271:14981–14988. (1987) Expression of a full-length cDNA for the human ‘MDR1′ gene confers resistance to colchicine, doxorubicin, and vinblastine. Proc. Natl. Acad. Sci. USA 84:3004–3008. (1988) An altered pattern of cross-resistance in multidrug resistant human cells results from spontaneous mutations in the mdr1 (P-glycoprotein) gene. Cell 53:519–529. (1993) Functional analysis of P-glycoprotein mutants identifies predicted transmembrane domain 11 as a putative drug binding site. Biochemistry 32:4185–4194. (1991) A single amino acid substitution strongly modulates the activity and substrate specificity of the mouse mdr1 and mdr3 drug efflux pumps. Proc. Natl. Acad. Sci. USA 88:7289–7293.